The Atlanta Fitted Hoodie comes in a choice of four colourways, which are available in Red/White, Black/White, Navy/White and Royal/White. 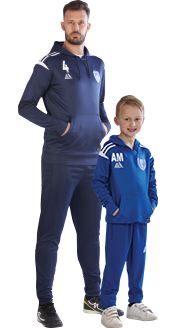 There are six sizes to choose from including SB, B and Y, which are suitable for children aged 6 to 14 and then SM, LM and XL, which are suitable for small to extra-large adults. 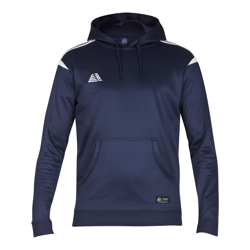 The fit on these garments is slim, however the stretchable fabric and soft fleece inner makes these training tops very comfortable to wear. 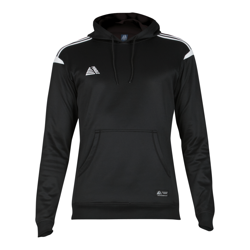 The hoodies come with an open hood with toggle fastening (no toggle on kids), embroidered Pendle logo and Performance Teamwear logo as standard. As with all Pendle products, each colourway is colourfast to ensure that colours remain wash after wash and further stitch strength and shade matching standards are industry leading. 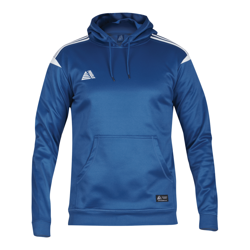 Pendle recommend choosing one of our package deals that include 15 printed hoodies with printed club badge and initials or numbers. 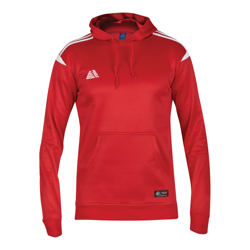 All our package deals offer the flexibility to be able to mix sizes and add extra garments at the same pro-rata price. If you like the Atlanta Fitted Hoodie, make sure you check our other Atlanta products: Atlanta Fitted Sweatshirt, Atlanta Fitted Quarter Zip Top, Atlanta Rainsuit, Atlanta Tracksuit, Atlanta Fitted T-Shirt and Atlanta Fitted Polo.